Water heating makes up over 20% of your homes annual energy bills, so upgrading your water heater to one of our high efficiency tankless water heater options makes more sense than ever. Whether you’re looking to RENT, FINANCE, or BUY, it’s never been a better time to upgrade to a tankless water heater! 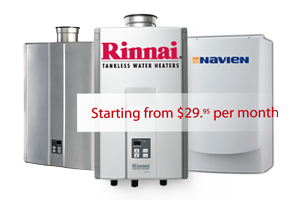 Go Tankless offers the most popular and reliable Rinnai and Navien Tankless water heaters. We also offer ENERGY STAR qualified Power Vented conventional tanks as well as Regular Vented water heating solutions in the greater Toronto area including Etobicoke, Aurora, Newmarket, Richmond Hill, Woodbridge, Mississauga, Brampton, Oakville, Burlington, Hamilton and more. The Go Tankless team has the expertise and experience to provide whole-home energy saving recommendations that offer overall comfort, health, and energy savings. We can fully meet and surpass all of your goals with our tankless service and installation teams.